Spring is here, and that means it will soon be time to celebrate the season together at Bilkent’s annual Spring Festival, with a great program of activities that will take place May 3 to 5 in the Main Campus festival area and at the Odeon. 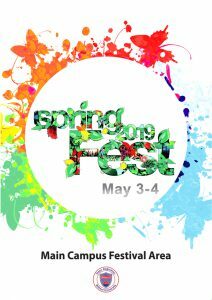 The schedule of events can be found at www.bilkent.edu.tr/baharsenligi in Turkish and www.bilkent.edu.tr/springfest in English. As announced previously, Gülşen and Teoman will headline the Odeon concerts on Friday, May 3 (Gülşen) and Saturday, May 4 (Teoman). Both concerts start at 9 p.m.
Tickets will be on sale online from April 15 through May 4 at https://stars.bilkent.edu.tr for students, https://bais.bilkent.edu.tr for staff and https://stars.bilkent.edu.tr/alumni for alumni. Students may purchase two tickets for each concert. Don’t forget that it will be necessary to present a Bilkent student, staff or alumni ID card to gain entrance to the concerts, as there will be card readers at the gates.